Aga cookers are a staple of many British homes – and for good reason – they combine fantastic cooking efficiency with a traditional aesthetic that completes any country home. These cookers have been on Britain’s shores for almost a century and are famed across the country for their reliability and ability to cook the perfect roast dinner! 1. The Aga range cooker was invented by Dr Gustav Dalen (Sweden). He was blinded in an accident in 1912 and during his recovery at home realised how difficult his wife found managing their traditional cooker. Instead of offering to help he disappeared to his workshop for several years to develop a cooker that was easier to use. It didn’t help his wife much but we have all benefited ever since! According to a study, it’s a widespread phenomenon not to mention that’s also heating the kitchen in the process. This is because traditional Aga cookers take a long time to heat up so cannot be simply switched on and off at will. However, AGA have recently created a solution with their Total Control model which can be easily switched on and off remotely. People may also leave them on because the temperamental summers in Britain are just not hot enough for most people! It’s a major selling point! Interestingly, more 18-24 year-olds see an Aga as making a home more desirable than a more traditional demographic (60+), showing how the cooker is having a bit of a renaissance with younger people. Do you know that the oldest Aga range cooker still in use in 2009 belonged to the Hett family of Sussex and was installed in 1932? The winner was found through a Telegraph survey of its readers so it’s possible there is still an older one faithfully working for a non-Telegraph reading family. This can include car gearboxes, guttering, lamp posts, door fitting and drain covers. Once they reach end-of-life (it takes a while), they can also be almost completely recycled. This makes Aga cookers far greener than people think and still dating back decades ago. 6. Aga range cookers may use more energy than a traditional cooker but it does more than just the cooker! It will heat your kitchen, dry laundry and some even heat water! They also provide a warm and cosy space for people and pets to gather around in the kitchen. Nearly 70% of all new Aga range cookers sold are now powered electrically. This has improved efficiency and meant that fuel costs can be greatly reduced. 8. The Aga range cooker was manufactured in Britain by AGA Rangemaster Ltd.
From 1940a until 2017 when the historic Coalbrookdale foundry closed. In 2017 it was sold to US-based company Middleby for £129 million. Essentially, this means coloured glass melted at extreme temperatures onto the cast iron parts! This tough exterior means the surface can be cleaned with vigour using a range of abrasive materials. The ideal temperature in the roasting oven is 230°C. This helps to ensure the food does not get scorched by intense heat – helping to preserve vital moisture and nutrients and making it especially well suited to the English Classic, the roast dinner. 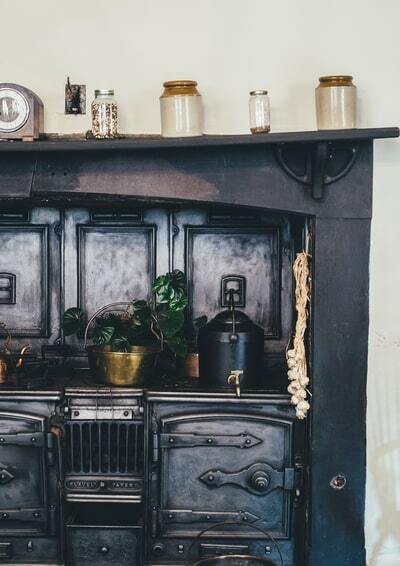 So, there you have it – 10 fascinating facts on Aga cookers, which have become an integral part to so many homes across the UK. It just goes to show the history and tradition behind the brand, which makes it an enduring kitchen fixture in many British homes. The legendary Aga cookers are an emblematic part of classic British households and their rich history is a surprise to none. They are efficient, cook amasing and last for decades. However, good aga cleaning requires professional know-how and care. That’s why at Thomsons Cleaning we clean each and every unit with both finesse and a timely manner. For more details, check our prices & deals or get in touch via phone or online.